Tom Petty: What's the Rest of the Story? Truth about His Death -- Is It Acute Chronic Alcoholism. Tom Petty is dead, but his overdose was only a dramatic symptom of his addictive disease. Don't be fooled. There is more to the story that you are not getting from the press concerning this tragedy. After researching his psycho-social history a bit, I have learned, as suspected that Tom Petty likely had a bio-genic, hereditary illness we now call acute chronic alcoholism. He inherited his susceptibility to this chronic, hereditary illness from his father who was an out-of-control physically abusive alcoholic who did not approve of his child's interests in the arts. His mother intervention is what saved him, but later, as result of his acquired illness, triggered by consuming alcohol, he became a drug addict as well, like millions of alcoholics do. He had nearly a walking medicine cabinet in him of cross tolerant, cross addictive drugs (with alcohol.) An overdose, inevitably killed Tom Petty like so many other people, including rockers. There is nothing unusual about Tom Petty's story, except his ability, like Michael Jackson and Prince, to access whatever drugs he wanted because of wealth, enabling, and a lack of influence and leverage that would have driven him into recovery. Don't let the media's glorification of Tom Petty allow you to miss the simple basics of this story -- this drug death we learned about is a manifestation of an illness that affects 1 out 10/11 drinkers and 1 out of 4 families. This is the publicity that should emanate from this news story. Alcoholics acquire alcoholism out of no fault of their own whatsoever by consuming a legal and socially acceptable food product when they start drinking for same reasons as most people do. Susceptibility then unwittingly kicks in. Unwittingly, they are sitting ducks because the earliest symptoms are nothing more than the ability to drink more than most people and feel great, not get drunk, drink more frequently, and have little effects--for years while they acquire tolerance to ethanol metabolization. Is this your experience or someone you know? If so, you will also feel more euphoric than your light weight social drinking friends. You will therefore hang out with folks more likely to drink like you do. 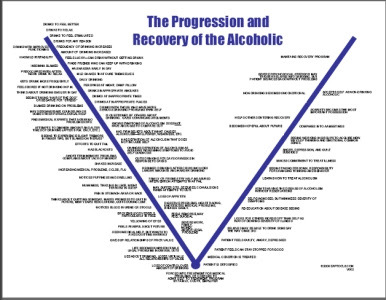 You will slowly acquire a definition of alcoholism that does not include yourself. And you will change that definition over time to eliminate the new symptoms you acquire. This is the nature of denial. It's insidious as hell. There is nothing mysterious about the origin of this disease. You can't even get research dollars anymore to study genetics unless it is really unique in its focus. Over 1000 adoptive twin studies have been conducted. An alcoholic parent increases the probability of acquiring alcoholism by over 400%. Proving alcoholism is genetic is old news. The movies, media, myths, and misconceptions, and thousand years of competing bogus theories before effective genetic research arrived still contributes to horrible confusion about alcoholism. The AMA and World Health Organization declared it a disease over 50 years ago. All of us are victims of this confusion, much of which is linked to economics because different professions compete for the treatment approach of people with alcoholism or and professional livelihoods or licensed professionals are linked to whatever model of understanding of the illness they are operating under. There really is no such thing as prevention of alcoholism unless you simply do not consume alcohol, or consume it so infrequently that you do not tax your genetic susceptibility to it. This is a tall order for a universally accepted consumer product 80% of the population enjoys. And with the positive effects in the first 15-20 years of drinking, what alcoholic is going to say WHOA! -- I quit! No way. - or give to a friend -- then print this handout: http://www.workexcel.com/content/PDF/V002.pdf - keep them in your medicine cabinet.